Northwestern State University Professor of French Horn Dr. Kristine Coreil will present a recital Tuesday, Sept. 12 at 7:30 p.m. in Magale Recital Hall. Admission is free and open to the public. Coreil will perform two solo works for horn, Vinter’s “Hunter’s Moon” and the “Rondo in B Flat” by Arnold Cooke. Both pieces are by British composers, and use traditional hunting horn calls as the main theme, reminiscent of the English fox hunt. Coreil will be joined by several NSU faculty and students for two chamber pieces. Dr. J. 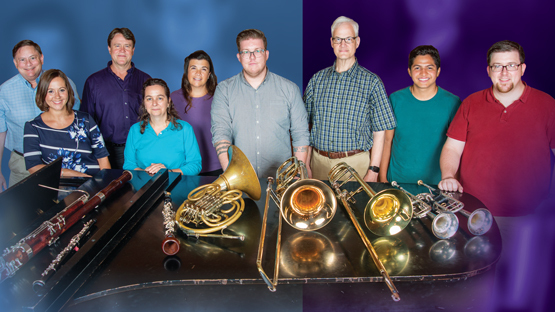 Mark Thompson and Andrew Eden, trombonists, and Dr. Adam Hudlow and student Francisco Ballestas-Sayas, trumpeters, will join Coreil in the “Brass Quintet” by British composer Malcolm Arnold. This piece is a standard in the brass quintet repertoire, and helped to establish the modern brass quintet instrumentation. Arnold’s Quintet is an audience favorite, featuring jaunty melodies, an eerie middle movement and finishing with spectacular trumpet fanfares. Finishing the program will be the Beethoven Wind Quintet, featuring Dr. Charles Jones of the Louisiana School for Math, Science, and the Arts in the featured piano role. The quintet is rounded out with Dr. Malena McLaren on clarinet, Dr. Douglas Bakenhus on bassoon and Leah Forsyth on oboe. The three-movement work is a standard in the piano and wind repertoire, and displays Beethoven’s early style of clear melodies, improvisatory piano flourishes and late classical harmonic language.